History Detectives investigates a portrait made by an American POW in a World War Two German prison camp. In 1943, as American air attacks against Germany increased, the Nazis moved the growing number of captured American airmen into prisoner of war camps, called Stalags. Over 4,000 airmen ended up in Stalag 17-b, just outside of Krems, Austria, in barracks made for 240 men. How did these men survive the deprivation and hardships of one of the most infamous prisoner of war camps of the Nazi regime? 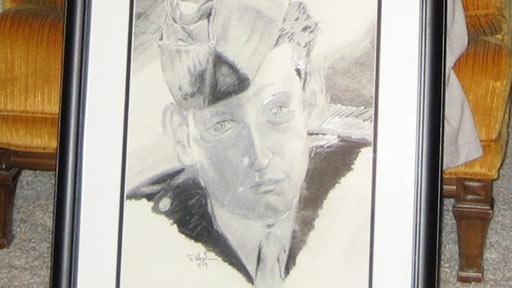 65 years after her father became a prisoner of war, Gloria Mack of Tempe, Arizona has a portrait of him which appears to be drawn by another POW while they were both prisoners in Stalag 17b. What happened to the artist? Did he survive the camp? History Detectives guest host Eduardo Pagán uncovers a stoic act of defiance and dignity behind the Stalag’s barbwire. Related Investigation Galleon Shipwreck Is this a piece of treasure from a Spanish galleon washed up on an Oregon beach? Also with Eduardo Pagán Clara Barton Letter What does this letter reveal about America's early efforts to honor its war dead? Also in Depression and WWII: 1929-1945 Alcoholics Anonymous Letter Is this letter proof of one man's contribution to this secretive society?